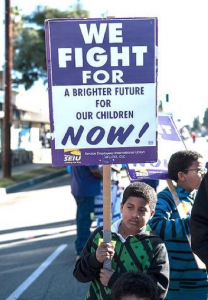 For years, the SEIU Local 99 has been “the other union” in LAUSD. Representing custodians, cooks, bus drivers and other “classified” workers, the union is just as politically influential, if not more so, than the teachers union, UTLA. And yet its voice is rarely heard in policy debates. 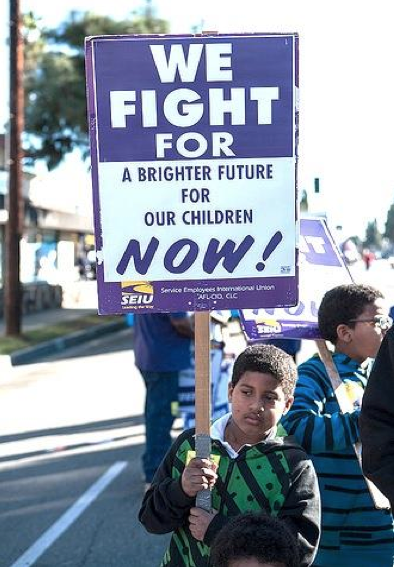 In a presentation to the LA Unified School Board on Tuesday, SEIU local 99 Executive Director Courtni Pugh laid out a vision to better connect community services to schools. Dubbed OASIS, for Optimizing Access to Services, Inspiring Success, the plan aims to turn local schools sites into a hub of community services, such as park space, libraries, health care providers and technology. Pugh’s goal is to set up six to 12 OASIS schools within LAUSD starting in the next school year. She hopes the project will get funding from a range of sources, including the City of Los Angeles, LA Unified and non-profits. At Tuesday’s meeting, school board members were practically falling over themselves to praise Pugh’s idea. Pugh, a former political director of the powerful LA County Federation of Labor, has headed Local 99 for just over a year. She was also recently named the chair of SEIU International’s education council. From that platform, she is wading into the education reform debate, staking out a middle ground between charter school advocates and teachers unions. “The debate on reform is false and silo-ed,” she said. More than half of her members have children that go to LA Unified schools, she said, and the majority of them live within 2.5 miles of schools they work in. Not only will OASIS create jobs (some, presumably, for her members), but her members will benefit from the services it creates. In a sense, OASIS grew out of Breakfast in the Classroom, an LA Unified program that provides, well, breakfast in the classroom. It has been heavily criticized by many teachers, who said it distracted students and left a mess. But when Superintendent John Deasy put the program to the board for a vote, hundreds of service workers rallied to support it, and the normally divided board unanimously voted to continue the service. Pugh expects getting OASIS off the ground to be even tougher.